If you're looking for a fast, funny read and you're a fan of mythology and magic in the modern world, here's a great pick. Atticus O'Sullivan is the last Druid, and is just trying to live peacefully, running his bookshop and hunting (in dog-form of course) with his wolfhound companion. He's also in hiding from a god he ticked off a few thousand years back, and that god has now decided to track him down in earnest, and try to off him once and for all. This has been called the "logical heir" to Jim Butcher's Dresden Files series, and I think that fits. The best parts of this series are its characters, particularly Atticus' vampire and werewolf legal team, and his relationship with his wolfhound, Oberon, who has recently decided he's very much like to be the canine Genghis Khan. An exciting, amusing read for fantasy fans - highly recommended! 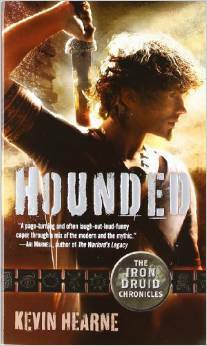 And if you want more reviews and similar-read recommendations, check out Hounded on our catalogue!